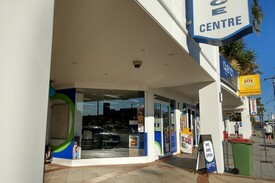 19 Commercial Real Estate & Properties in Broadbeach are listed in 1 categories. We have 20 Retail ShopsLease . 39m² retail or office Perfect for a small to medium business looking to get exposure in Broadbeach Newly painted walls medical grade coved flooring Open plan space with loads of natural lighting Located on busy Victoria Avenue in Victoria Square across from the Oasis Shopping Centre Available to lease now! Approximately Disclaimer: Ray White has not independently checked any of the information we merely pass on. We make no comment on and give no warranty as to the accuracy of the information contained in this document which does not constitute all or any part of any offer or contract by the recipient. Prospective purchasers / lessees must rely on their own enquiries and should satisfy themselves as to the truth or accuracy of all information given by their own inspections, searches, inquiries, advices or as is otherwise necessary. No duty of care is assumed by Orchid Avenue Realty trading as Ray White Surfers Paradise Commercial divisions toward the recipient with regard to the use of this information and all information given is given without responsibility. Situated in the centre of Broadbeach, only metres from the beach and directly opposite the Oasis Shopping Centre, this is the ideal spot for your restaurant. The space offers: 241m2 total area Kitchen which includes built in cold room, canopy and built in stainless steal benchtops Bar area fully plumbed to basement kegroom 2 parking spaces Occupy as a restaurant to re fit to take advantage over the retail frontage for your business (office or retail). Please contact Adam Grbcic. 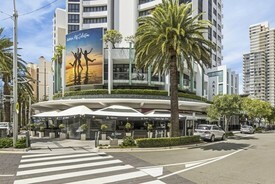 Contract Collapse - Vendor Requires Immediate Action $972 per week + outgoings..
130sqm plus large alfresco dining area Huge foot traffic and pedestrian flow Surrounded by highrise residential buildings and holiday resorts providing a strong customer base Walking distance to Star Casino, Gold Coast Convention Centre and the Light Rail 2 exclusive use car parks with ample visitor parking public transport access Incentives on offer The property forms part of the recently renovated Broadbeach Mall. Metres away from Broadbeach's famous beaches, parks and the brand new Kurrawa Surf Club. Occupied by a hugely successful business for over 20 years. Contact your exclusive agent Brandon Johnson! approx. Disclaimer: Ray White has not independently checked any of the information we merely pass on. We make no comment on and give no warranty as to the accuracy of the information contained in this document which does not constitute all or any part of any offer or contract by the recipient. Prospective purchasers / lessees must rely on their own enquiries and should satisfy themselves as to the truth or accuracy of all information given by their own inspections, searches, inquiries, advices or as is otherwise necessary. No duty of care is assumed by Orchid Avenue Realty trading as Ray White Surfers Paradise Commercial divisions toward the recipient with regard to the use of this information and all information given is given without responsibility. Over 80 metres of frontage on Gold Coast Highway Land area: 2595m2 Building area: 446.9m2 Option to combine Shop 1 (453.7m2 ) to make a combined area of 900.6m2 if required Opposite light rail Huge Signage Exposure Single level basement car park with plenty of outside customer parking This opportunity will not last Approx Disclaimer: Ray White has not independently checked any of the information we merely pass on. We make no comment on and give no warranty as to the accuracy of the information contained in this document which does not constitute all or any part of any offer or contract by the recipient. Prospective purchasers / lessees must rely on their own enquiries and should satisfy themselves as to the truth or accuracy of all information given by their own inspections, searches, inquiries, advices or as is otherwise necessary. No duty of care is assumed by Orchid Avenue Realty trading as Ray White Surfers Paradise Commercial divisions toward the recipient with regard to the use of this information and all information given is given without responsibility. Over 80 metres of frontage on Gold Coast Highway Land area: 2595m2 Building area: 453.7m2 Option to combine Shop 2 (446.9m2 ) to make a combined area of 900.6m2 if required Opposite light rail Huge Signage Exposure Single level basement car park with plenty of outside customer parking This opportunity will not last Approx Disclaimer: Ray White has not independently checked any of the information we merely pass on. We make no comment on and give no warranty as to the accuracy of the information contained in this document which does not constitute all or any part of any offer or contract by the recipient. Prospective purchasers / lessees must rely on their own enquiries and should satisfy themselves as to the truth or accuracy of all information given by their own inspections, searches, inquiries, advices or as is otherwise necessary. No duty of care is assumed by Orchid Avenue Realty trading as Ray White Surfers Paradise Commercial divisions toward the recipient with regard to the use of this information and all information given is given without responsibility. Over 80 metres of frontage on Gold Coast Highway Land area: 2595m2 Building area: Shop 1: 453.7m2 Building area: Shop 2: 446.9m2 Lease individually, or option to combine both shops to make a combined area of 900.6m2 Opposite light rail Huge signage exposure Single level basement car park with plenty of outside customer parking This opportunity will not last Approx Disclaimer: Ray White has not independently checked any of the information we merely pass on. We make no comment on and give no warranty as to the accuracy of the information contained in this document which does not constitute all or any part of any offer or contract by the recipient. Prospective purchasers / lessees must rely on their own enquiries and should satisfy themselves as to the truth or accuracy of all information given by their own inspections, searches, inquiries, advices or as is otherwise necessary. No duty of care is assumed by Orchid Avenue Realty trading as Ray White Surfers Paradise Commercial divisions toward the recipient with regard to the use of this information and all information given is given without responsibility. Rare Retail Leasing Opportunity $1,775/m2 Gross Rental Ne..
NOW you can place your business at probably the best position in the Niecon Plaza complex at the Broadbeach Mall. The opportunity is in a choice of high profile retail positions inside NIECON PLAZA. Ground Floor RETAIL SHOPS From 21 m2 to 170 m2 First floor 500M2 area suitable for Gym with access form Victoria St Mall and escalator from the Centre To register your interest contact Marius Von Zeppelin.